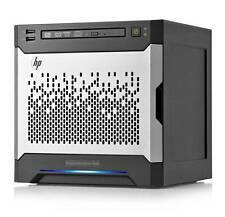 Custom-built server, in a case with 4 hot-swappable drive bays, ideal for NAS use but would be equally suited to running Linux/Windows/etc. Was originally used to runFreeNAS (r eady to go, just add a USB stick to boot FreeNAS from). N40L Microserver with 4GB RAM and WD 160GB HD. CPU = AMD Turion II Processor Model Neo N40L (1.50 GHz, 15W, 2MB). 1x WD 160GB Blue 3.5" SATA drive in Bay 1. 4x GB ECC DDR3 RAM. 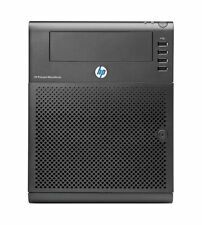 The HP product product spec sheet is here. BIOS settings reset to defaults and passwords removed. This is a powerful Server that has been processed through our system. The full specification is detailed below and upgrades are available if required. Standard: 4GB (1 x 4GB) PC3L-12800E DDR3 UDIMM. HP iLO (Firmware: HP iLO 4)6. HP Ethernet 1Gb 2-port 332i adapter. This signature is verified before the flash process starts, reducing accidental programming and preventing malicious efforts to corrupt system ROM. 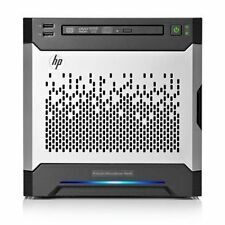 This is my much beloved HP N40L Microserver. It also has a built in TBS 6984 Quad DVB-S2 Sat tuner card, the card is mounted horizontally using a PCIe riser installed in the N40L's PCI1x slot. You can swap the TBS cards over allowing the N40L to operate as a tuner and digital video recorder for either FREESAT or FREEVIEW. Refer to the HPE website for details. Weight6.5 kg. Height23.5 cm. Depth25.4 cm. Width23 cm. Service & SupportLimited warranty - parts and labour - 1 year - on-site. Manufacturer Warranty. OS CertifiedMicrosoft Windows Server 2012 R2, Microsoft Windows Server 2016. Product Family: ProLiant MicroServer Gen10. Product Series: MicroServer Gen10. Processor Type: Opteron. Product Line: ProLiant. Form Factor: Ultra Micro Tower. Product Type: Server. Ethernet Technology: Gigabit Ethernet. 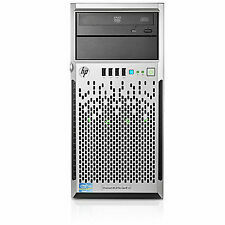 Product Family: ProLiant MicroServer Gen10. Product Series: MicroServer Gen10. Processor Type: Opteron. Product Line: ProLiant. Processor Manufacturer: AMD. Form Factor: Ultra Micro Tower. Product Type: Server. Processor Model: X3421. Product Series: MicroServer Gen10. Product Family: ProLiant MicroServer Gen10. Manufacturer: HPE. Product Line: ProLiant. Hot Swappable Bays: No. International Orders. Processor Speed: 2.10 GHz. Product Series: MicroServer Gen10. Product Family: ProLiant MicroServer Gen10. Manufacturer: HPE. Product Line: ProLiant. Hot Swappable Bays: No. International Orders. Product Type: Server. Processor Speed: 1.80 GHz. Processor model X3418. This compact and easy to use server can be placed almost anywhere. Be Productive and Customize With ClearOS Software from HPE. Processor cache type L2. Processor cache 2 MB. Processor family AMD Opteron.